Santa Clara, CA, August 03, 2018 — Everest Networks announced today the introduction of their latest access point (AP), the AP1004WRi, as part of its high-capacity Wi-Fi platform. The AP1004WRi is engineered to address the high-density challenges in indoor venues such as transportation hubs, education campuses, convention centers, retail outlets, and BYOD enterprises. Indoor Wi-Fi has shifted from coverage only to coverage and capacity, resulting in deployment challenges and difficulties. The industry’s traditional approach to these challenges has been to either increase the APs power, add more APs, or both. This easy quick-fix is outdated and in fact results in negative consequences. Adding more APs incurs additional costs while also increasing interference, similarly to increasing power, and thus failing to address the problems at hand. 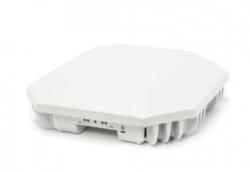 Everest Networks’ revamps the traditional approach to today’s indoor Wi-Fi challenges via its leading-edge indoor AP. The AP1004WRi is a next-generation, multi-gigabit 802.11ac AP featuring the most advanced and innovative RF capabilities including quad radios, patented antenna technology with multi-radio beam-forming and shaping, 4×4:4 MIMO and MU-MIMO capabilities, dual-band scanning radio and BlueTooth Low-Energy radio. The 3x 5GHz radios and 1x 2.4GHz radio within a single RF-isolated AP deliver unprecedented capacity per AP, achieving up to 3x increased throughput compared to leading enterprise APs. Utilizing Everest’s SpotLight Beam antenna system, the AP1004WRi’s uses reconfigurable directional antennas to enable wide or focused coverage within a coverage area. Additionally, artificial intelligence is used to manage and optimize both coverage and capacity for peak performance. Deploying the AP1004WRi results in reduced interference, increased capacity, with a lower TCO compared to competitors. As worldwide data and video traffic is growing at double-digit rates, and the number of connected devices per person continues to multiply, the increased pressure of capacity will continue to overwhelm networks. Everest technology future proofs your network! Call (408) 300-9236 with any questions, or simply visit www.everestnetworks.com and discover what peak performance truly means. Venture funded Everest Networks launched their industry leading High-Density Wi-Fi solution in 2017 and has achieved outstanding success so far by securing key reference sites such as Lincoln Financial Field, home of the Super Bowl champions, The Eagles. Everest Networks' solution addresses today’s most pressing high-density issues such as; high user engagement, high network capacity, and fast throughput, whilst delivering a lower total cost of ownership (TCO). This makes Everest Networks Wi-Fi the platform of choice for venues such as stadiums, arenas, convention centers, shopping malls, transport hubs, auditoriums, campuses, and smart cities.